Workers of a Philippine garments factory supplying to Costco, Disney and Korean brands started protests today against a planned shutdown. The factory Sein Together Philippines will close temporarily for one month by end of September due to alleged lack of orders. However, the workers charge that the orders are being shifted to other factories and the shutdown is meant to harass union members into accepting separation. In a memo announcing the shutdown, management also offered separation to workers. Since then, workers have observed bundles of textile being trucked out of the Sein Together warehouse. 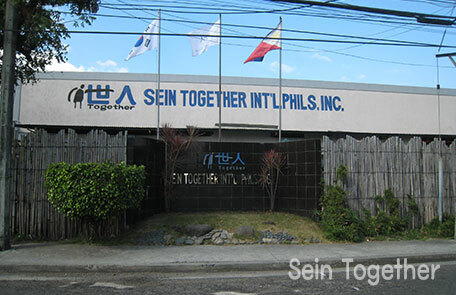 It is suspected that the raw materials and the orders have been shifted to Sein Together’s sister company S&S and another Korean-owned factory called Do First. The illegal shutdown is just the latest in a series of attempts by management to subvert the workers’ freedom of association. When the union was formed early this year, suspected leaders were transferred to a single production line to separate them from other workers. Then the factory was also closed temporarily in April. Management personnel started a whispering campaign that the factory will close down if the union proceeds. Management further convened several meetings of workers to discuss the alleged drawbacks of a union. The workers union of Sein Together has filed a complaint at the Labor Department for illegal shutdown. The company did not attend the hearing called by the Labor Department last Monday. To coincide with another hearing today, workers are wearing red ribbons to symbolize their opposition to the planned shutdown and union repression. The union is calling on the company to stop transferring the orders to other factories and to remain in operation.